Tours, France, ca. 1465-1468 ; Bourges, France, ca. 1470. Red morocco gilt, French, 17th century, one remaining clasp, with the chiffres of Charles d'Orleans-Valois, comte d'Angoulême; in red box case. Purchased with the assistance of the Fellows, 1950. Thought to have been commissioned by Antoine Raguier, ca. 1466-68; finished for Jean Robertet and his wife Louise Chauvet, ca. 1470; bound in red morocco for Charles d'Orleans-Valois, duc d'Angoulême (1573-1650); Major G.L. Holford; purchased by A. Chester Beatty from the Holford Sale in 1927; Mrs. Chester Beatty; Maggs, 1950. 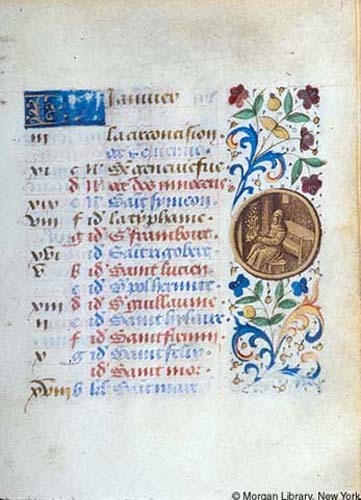 Ms. book of hours for the use of Rome; calendar in French; written and illuminated in Tours, ca. 1465-1468, and Bourges, ca. 1470. Folios 13r, 15r, 17r, 19r, 21r, 25r, 29r, 40r, 51r were illuminated by Jean Fouquet in Tours, France, ca. 1465-1468. The remainder of the manuscript was illuminated by Jean Colombe in Bourges, France, ca. 1470. Decoration: 25 full-page miniatures and 24 calendar medallions; monogram AR and motto "s'il avient" (Behold he arrives), apparently of first owner Antoine Raguier (? ), incorporated into decorative scheme; the initials RL and motto "Chaste vie loue" (Chaste life praises) for second owners (Jean Robertet and his wife Louise Chauvet) appear in Colombe's section of the book. Antoine Raguier (ca. 1420 -1468), was counselor and treasurer for war to Charles VII. Jean Robertet was secretary to Louis XI from 1469 at which time Colombe also entered the service of the king. Artists: Jean Fouquet (first 9 miniatures) and Jean Colombe (last 16 miniatures).